I went to the Burke Museum in Seattle to see the Here and Now exhibit http://www.burkemuseum.org/hereandnow . Its focus is on how today’s artists learn from past generations. For Native people there often are gaps in knowledge being pass down so they rely on photos or deconstructing weaving to learn how it was done. It was quite inspiring to see how they brought to life the past into today’s issues. I thought of what we have learned in the Legends programs and the possibilities with using the ANWG grant for mentoring. We are fortunate to have so many around us in the guild who are willing to share. OWG Show & Sale is December 6th & 7th! 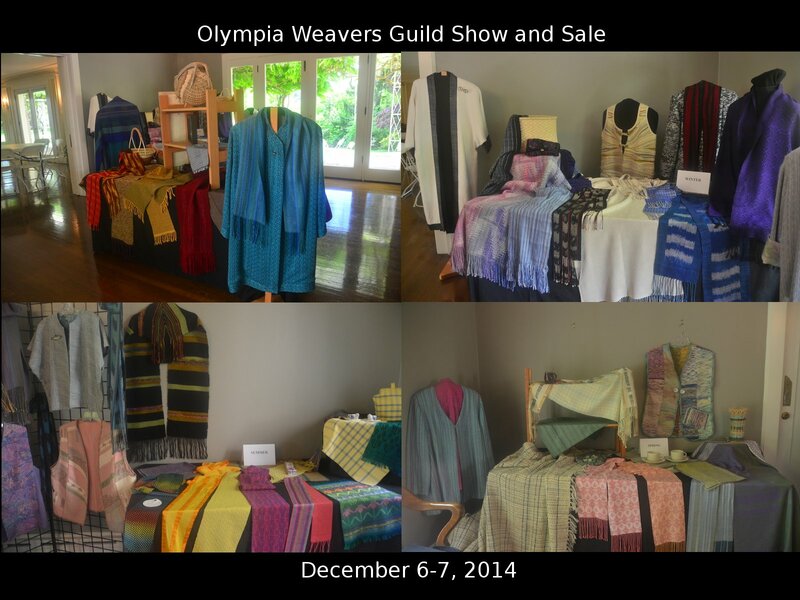 Come see what the Olympia Weaving Guild has been making this year! Stop in this weekend, chat with members, and find one-of-a-kind handmade items for gifts for loved ones, or perhaps something for yourself. Handspun yarn; knitted, felted, and handwoven articles; kumihimo jewelry; handmade baskets; tapestries and many, many other items created by our members will be available. Olympia Fire Station #7, 5046 Boston Harbor Rd NE, Olympia WA 98506. To see what the 2013 Show & Sale looked like, click here.